It's really hard to ignore the big price difference between "brand name" ink cartridges supplied by printer manufacturers such as HP, Canon, Epson, Lexmark, and the alternatives. Compatible off-brand, refilled or remanufactured inkjet printer cartridges typically cost 15 percent less than OEM (original equipment manufacturer) cartridges at OfficeMax, Staples, Best Buy and other physical stores that sell computer supplies. Online, the deals are even more tempting. You may find websites selling discount ink cartridges costing 30, 50, or 70 percent less than brand-name goods. Nonetheless, many people hesitate to buy no-name or remanufactured ink cartridges. There is a persistent rumor that using anything other than manufacturer branded OEM cartridges will void a printer's warranty. That is not true, at least in the United States. The 1975 Magnuson-Moss Warranty Act (15 U.S.C.A. 2302) forbids the conditioning of a warranty upon the purchase of any product or service "which is identified by brand, trade or corporate name." In other words, your printer's warranty cannot be voided just because you used an ink cartridge from a third-party seller. Whether an off-brand compatible or remanufactured discount ink cartridge will perform as well as an OEM cartridge depends, of course, on how well it is made. A fly-by-night outfit may use inferior inks that don't produce vibrant, non-fading colors; skimp on cleaning print nozzles and other parts; or skip quality control testing to save money. Shoddy cartridges can leak and ruin the electronics of a printer. To find a reliable supplier of discount ink cartridges, try searching for your printer model online along with keywords such as "compatible", "refilled" or "remanufactured" ink cartridges. Look for suppliers who have loyal fans and have been in business for a number of years. Also look for warranties provided by suppliers. One supplier I've used is LD Products, which has been around for over a dozen years, and offers a 100% satisfaction guarantee on all products. Here's a personal example: My HP OfficeJet Pro uses a cartridge which retails for $49.99. LD sells a remanufactured replacement cartridge for $8 that works beautifully. Print quality are page yield are the same as the OEM cartridge, and I save $42 on each one! For years, I was buying the expensive HP-labelled cartridges from an office supply store, under the false assumption that generic or remanufactured cartridges might not work in my printer. 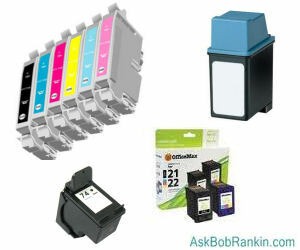 Of course LD also offers replacement ink cartridges for Brother, Canon, Dell, Epson, Lexmark and other popular brands. If this sounds like a sneaky advertisement for LD Products, well, it's not. I'm just a happy customer passing along a tip, and LD doesn't give me any special treatment or incentives. I've also used 123Inkjets.com and found that their products and prices are generally great as well. Amazon also sells inkjet cartridges from a variety of third-party sellers such as CompAndSave, INKMATE, Memjet and HOTCOLOR. I have no personal experience with any of those sellers, so I'd advise you to check the ratings and reviews before ordering. The popular office supply store Office Depot also sells their own brand of laser toner and inkjet printer cartridges, which they say are manufactured using ISO-certified processes, and are made "to meet OEM performance standards." These ink cartridges are guaranteed compatible with the OEM branded cartridges in quality, reliability, and page yield. Office Depot, Staples and other office supply stores sell replacement cartridges for Canon, Dell, Epson, Hewlett Packard, Lexmark and many other printer brands. Printer manufacturers, of course, don't like it when people use compatible or remanufactured ink cartridges. That's because they make more money selling ink than printers. Witness the $29 price tag on this HP DeskJet 1112 Compact Printer https://amzn.to/2DdWvQP and the $32 Canon Pixma MG2522 All-in-One Inkjet Printer, Scanner & Copier. If entry-level printers like these do come with ink, it's a small-capacity cartridge. The XL replacement cartridges for the Canon MG2522 will run you $55. So OEMs have tried many ways to discourage consumers from buying discount ink cartridges, and have also tried to sue remanufacturers out of business. Generally, courts have upheld consumers' rights to save money with compatible and remanufactured ink cartridges. In May 2017, the U.S. Supreme Court ruled against Lexmark, which was suing a company that sells refilled ink cartridges. That's legal affirmation from the high court that third-party companies have the right to continue selling refilled or remanufactured ink cartridges. So the best OEMs can do today is to try to scare you. Some OEMs include software with their printer utilities that checks the "authenticity" of newly installed ink cartridges. If the software detects a remanufactured cartridge, a warning pops up on your screen telling you that the cartridge is not "genuine" and "may" damage your printer. If this happens, press the "I Like To Save Money and You're Not Scaring Me" button. But sometimes OEMs take it to the next level. A while back, my HP printer displayed a message saying that all four of my (third-party) inkjet cartridges “appear to be damaged” and I could not print anything. HP had effectively locked my printer with a software update, in an attempt to force me to buy their cartridges. Fortunately, the nice folks at LD Products were willing to replace my cartridges. Personally, I've never had a print quality problem with remanufactured or compatible ink cartridges. (Years ago, I ruined a few shirts while trying to refill my own cartridges, but that's another story.) Using them is a great way to save money and recycle plastic cartridges. Some remanufacturers partner with local charities to collect empty cartridges, paying a bounty on each cartridge to the charities. That's a good way to spread the benefits of recycling around. Most recent comments on "The Truth About Discount Inkjet Cartridges"
My experience with Epson is similar to others. I started using other brands and after firmware updates I received warnings about not using Epson Brand ink. Even though the cartridges were working fine until then the notice was strongly worded. The printer shut down and customer service said it needed factory service. NOT!! No problems until the update and it was being carefully used. I had the same experience as your example with HP. My printer would not run with reman'ed carts. To the best of my knowledge, HP has never repeated that bit of skullduggery. I have refilled cartidges and bought compatible cartridges for decades, and they always worked. One time nothing I put in would work except a brand new Canon cartridge, so I threw out the printer and sure enough Canon got told to fix their printers before they got a class action lawsuit. Now everything works in my Canons. Never owned an HP, never will. I have an OfficeJet 5745. Where do I go and what do I do to make sure I have disabled automatic updates in the future on this printer? Still get annoying reminders to buy their ink. When will the firmware issue be reversed? This is my last HP printer and I was just about to buy a new computer and printer. Too bad HP. I take my cartridges from work. They only buy the best so there is never a problem. For printers that have a heater chip on the cartridge, using a remanufactured cartridge is of little risk to your printer. If however, your printer has a non-replaceable printhead and uses a cartridge that has only ink in it, then the risk could be higher. In the first case, if the ink is bad or the nozzles are clogged, well you are out an ink cartridge. In the second case, the bad ink could damage the printhead and then you are talking about more than just print quality. Bought replacements from Staples, felt pretty good about the whole deal, until I installed the 2nd black cartridge. Everything came out with a green tint for a few days, the, it started skipping huge blocks of graphics. Back to Canon for me. I have been using compatibles or refilling OEM's for probably 2 decades! I have also refilled compatibles. We print a LOT in our household, so the economics was worth the gamble. Fortunately the gamble has worked out. Epson used to be an easy refill, Canon still is, Never had a Brother inkjet and HP, well..the last HP that I owned used those funny looking, I believe that they were #2 cartridges. I loaded a brand new OEM cartridge that was 2 months out of date and it wouldnt accept it. At that point it went out to the top of the trash can and a scavenger got it. I will bet that they're sorry,especially because even with OEM's this printer (which was supposedly a photo printer) had terrible results and no amount of fine tweaking could change that! When my current trusty Canon bites the dust, (and we have burnt out several printers) I'm going to get one of those new bulk tank refillable jobs! I have not used OEM cartridges or any cartridges from from alternative suppliers. For the last 7 years I have used RIHAC system. A continuous ink feed to the cartridges. Here in Australia the cost of replacement cartridges for my Brother MFC is $145. For the Rihac system the total package is $129 and comes with prechipped cartridges and a four compartment tank which hold 100ml of each of the inks. They also supply for many brands which may have 5 or 6 colours. The ink quality is as good as the OEM. I've been using remanufactured ink cartridges for years. Until lately, I had been getting them from Meritline, but they apparently retired. DRATS! I've had some problems installing the cartridges, but that was my failing, not the fault of the cartridges. Bottom line, I don't recall ever having a bad cartridge. If you have any thoughts on other suppliers, I - and probably others - would be interested in knowing about them. While I have your attention - THANK YOU FOR YOUR EXCELENT EMAILS, AND PARTICULARLY ON INK CARTRIDGES. I've been "scared" to use cartridges other than HP, so a few times, I've purchased EXPIRED ink cartridges from EBAY. I make sure that the photo and expiration date is clear, the package is listed as new or unopened, and that the seller has a good reputation, and I've only gotten one that was a total dud out of about ten. Less than five years old is ideal, but I've purchased ten year old ink with good results. I've just tried refilled Epson cartridges in my Epson printer - working fine although for a while I had a tussle with the printer as it wouldn't let me do anything when first loaded and had o find out what to do - in the end just hit print and it did - although didn't do the ink check thingy first does and probably uses up a lot of ink! Colours are fine and cartridges are recognizably Epson. I have used ASAPInkjets for years and their cartridges have worked excellently on my Canon Pixma 922 for years. The printer just went belly up, so have gotten another Canon about a week and a half ago; have not yet used up the initial ink supply so don't know if there will be a problem yet. However, ASAP is a good resource. I used to own a fairly expensive HP Deskjet printer. The OEM cartridges were expensive. I began dealing with PrintPal and saved a lot on ink. Then I got a message on the printer that I was not using their product. It would not allow me to print. I spoke to PrintPal. They told me a few things that might work with no luck. My good printer went in the garage, and I bought an inexpensive Brother printer that I am still using. The cartridges cost less than $7 with free shipping. I once received a cartridge that was leaking They replaced it with no problem. I have used many different kinds of third party cartridges over the years, and my experience has been mixed. The capacity, or number of pages printed also seems to vary widely from one cartridge to another. Yes, the price is definitely a strong incentive to go for the substitute cartridges, but when I find a reasonably similar price for original cartridges, I go for the original. I've used the Epson EcoTank printer for two years now and haven't had to refill the color tanks yet. I bought black Epson ink refills on Amazon for a reasonable price and have refilled the black ink once now. Back when I used cartirdges I started buying them at Cartridge World (a national ink cartridge refilling company). They were nearby and would replace them if anything went wrong. >>What about Ink refills for the Epson EcoTank printers? Any advice for what ink to refill the tanks with? I've been buying generic refills for 20 years and rarely had a problem. Lexmark and Brother have been excellent on refills. But, I do not install firmware updates! If the printer is working fine, and they always are, then no need to update the firmware. Often the updates are just triggers to reject the generic cartridges. Amazon has been my cartridge supplier for the last decade. When the printer tells me the cartridge needs to be replaced I wait until I see evidence that it really is low. There's more reader feedback... See all 80 comments for this article.